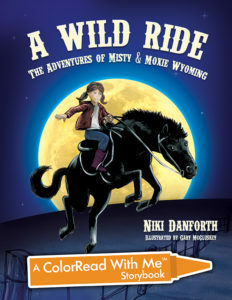 Check out the coloring book version of A Wild Ride: The Adventures of Misty & Moxie Wyoming! This ColorRead with Me™ Storybook is not only an adaption of the middle grade novel, but an opportunity for adults to read an adventure story to children as young as five. When it comes to the artwork, kids of all ages will enjoy coloring the lovely drawings, bringing their own creativity to the process of what the artist has already started. 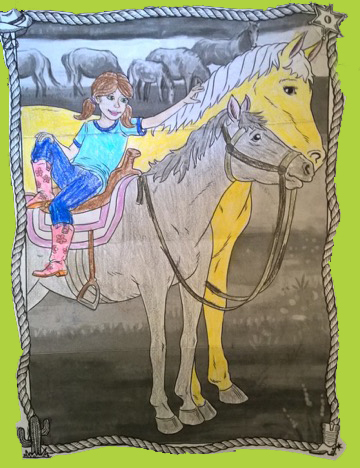 A young horse fan who read this version of A Wild Ride colored in one of the pictures and sent it for me to enjoy! It was right after I published the book, and her picture made my day!